It took 1:45.10 from the time the starting gates sprang open for the Grade 3, $250,000 Bourbon Stakes to when Current and Henley's Joy hit the wire. But Current's connections had to wait just a few minutes longer to find out if they were, indeed, heading to the Breeders' Cup. "It was so close, I didn't know if I had it," jockey Jose Ortiz said. 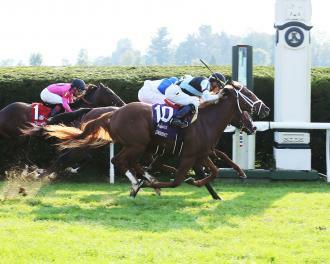 After the photo was scrutinized for several long minutes, the furiously closing Current and Ortiz had, indeed, gotten up by a nose over Henley's Joy, snatching the Bourbon's automatic berth into the Breeders' Cup Juvenile Turf on Nov. 2 at Churchill Downs. Current ($11.80), who broke from post 9 in the field of 13, was ninth after a half-mile. Post-time favorite War of Will, who broke from the rail, led the way through a moderate opening half of 48.82 seconds on turf officially rated firm. Ortiz maneuvered Current out for clear running room around the far turn, but had to deal with some greenness from his mount, who was making his third career start. "I hit him left-handed, and he drifted out two or three paths," Ortiz said. Meanwhile, up front, War of Will had kicked on to lead by 1 1/2 lengths in upper stretch, but challengers were closing in on both sides of him. Henley's Joy, who had tracked the pace in the second flight along the inside early under Tyler Gaffalione, snatched the lead between horses in the final strides. However, he quickly found Current, who had found his best stride to make up 5 1/2 lengths in the final furlong, alongside. The two swept past the winning post together. In the blanket finish, Henley's Joy was second by just a nose over Salvator Mundi, who bested War of Will by three-quarters to round out the trifecta. Current, a son of Curlin, is trained by Todd Pletcher for Eclipse Thoroughbred Partners and Robert LaPenta. The colt, bred by the boutique family Hinkle Farm operation, is a half-brother to Grade 1 winner Weep No More, and his second dam is Kentucky Oaks winner Flute. Eclipse and LaPenta purchased the colt for $725,000 out of the Keeneland September yearling sale, and he has now won two of three starts. After finishing third on debut at Saratoga behind Fog of War - who went on to win the Grade 2 Summer Stakes at Woodbine - he broke his maiden next out at Belmont, setting him up for his stakes debut. “He’s been training very professionally," Pletcher assistant Ginny DePasquale said. "We’ve really thought a lot of this horse. Todd thought he had a good future. So he sent him here and, of course, he was right."